Where may be had a great variety of Carols, Songs, Histories &c.
It was Adam's trransgression that has wrapt us in. 'Twas Caesar commanded the same should be so. While she lay a mourning the blessed Prince was born. Then in a horse manger they laid him to sleep. Christ Jesus our Saviour was born on that day. To the God be all glory our heavenly king. Source is the Broadside Douce adds. 137(45); the Bodleian Library number is Bod24362. 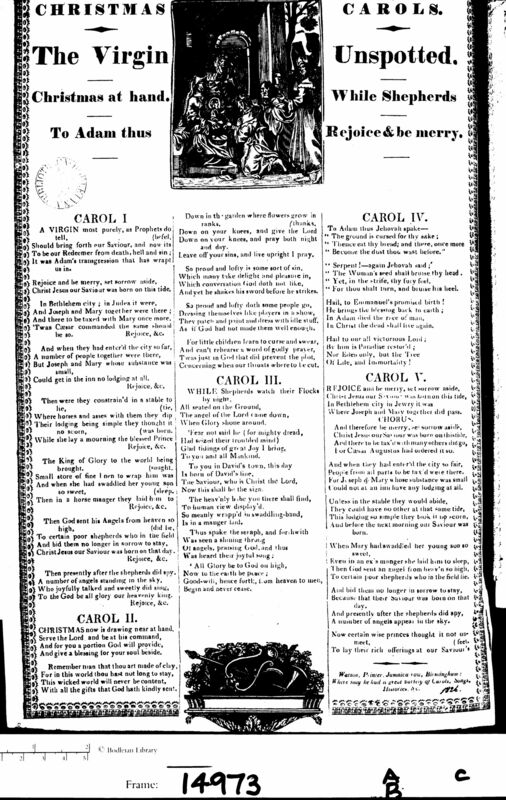 The title is Christmas Carols | The Virgin Unspotted (link is to the broadside sheet at the Bodleian Library). The printer is Watson, Printer, Jamaica row, Birmingham: "Where may be had a great variety of Carols, Songs, Histories &c." There was a handwritten note of the date: "1826." Carol II. Christmas now is drawing near at hand.